so I decided to try and re-create it in watercolor and ink in my art journal! Who needs fabric when you have beautiful pigments and a wonderful, hairy brush! I didn’t trace the pattern in the book; instead, I freehanded it. So it’s not all perfect and symmetrical, but it’s ok. Life’s not perfect either. I may give this another try on watercolor paper. 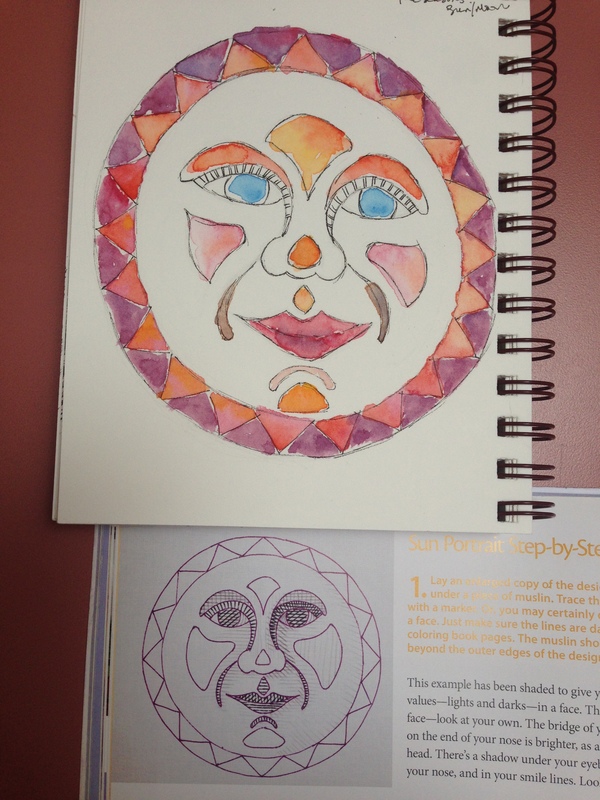 I think it would be fun to do a watercolor portrait of the sun and the moon. Ideally, I’d give Ms. Carlson’s idea my own twist, but we’ll see if my creative bones are working next time out. Happy Tuesday! Enjoy summer while it’s here, you summer lovers! I’m looking forward to red, yellow and orange TREES. And the smell of the LEAVES. I can’t WAIT. Oh, and football! 😀 Can’t forget that. Ooh, apple cider! Yes, fall is my favorite season. And it’s calling me. 🙂 Shall we call it the Autumn Dance? We shall. Peace. Thanks, Debi! Wow, I’m looking forward to all of those paintings too! hehe We’ll see …. Thanks for your encouragement, as always. Very masklike. Reminds me of Mexican sun masks too…wonder if that was her inspiration? Yours has more personality though. And I could see you doing one in very intense colors. Or autumn colors, why not? 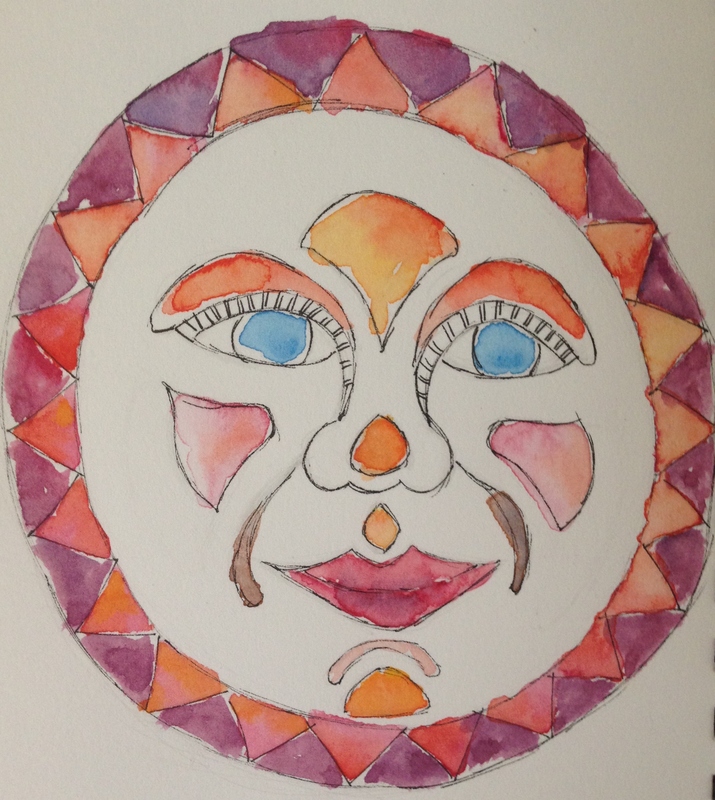 And earthy sun! Ooh, great ideas. I went back to the book, but she didn’t say where she got her inspiration. I did think of you and the masks! And you really should sell your idea seeds. They’re valuable things. I love that earthy and autumn sun idea. I was thinking about making a seasonal thing with this idea, but earthy sun is one I’d not considered. Love! Thanks! You’re a good soul. Thank you. You’re right, Jodi, it does go by so fast. hehe, of course! Football’s coming, baby, gotta love it! Although I do prefer baseball since the whole Ray Rice debacle, I have to admit. I really dislike summer, although it hasn’t been so hellishly hot this year. I can go out in winter in a light jacket, but in summer, I feel like I’m boiling! Boiling + lots of time in the kitchen does not equal a happy Laura, lol. Anyway, I’m glad you enjoyed it. Stay tuned for tomorrow’s. Your favorite season is spring, right? Spring is my second fave. ….I recall having a large paper fan of this same (type of) face which–when unfolded–became a great tissue paper-ribbed bright yellow circle meant to be hung in a window or in front of a light. I believe it was German. This is such a great nostalgic reminder of that! thank you Laura. You are welcome Lance! I am so glad it called up a terrific memory for you. I bet, Sharon, and thank you! Oh, I hope to post something that will spur you on to make some more beautiful art! That’s a happy image. Nice work. But wait–why are we talking about fall? Um, because it’ll get me through August? I do this every year at about this time. Just dying to make it through. I prefer winter to summer. 🙂 The heat and I don’t mix. I’m with you there, Laura. Heat makes me languid and even less ambitious than my usual slacker pace. LOL I’m surprised to hear that! Yeah, I could crawl in a hole most days. With ice cubes. lol. I’m glad I’m not alone. Is fall your favorite season? Yes! Well, also Spring. And winter. LOL You do sound like me. Thank you, Kirk! I always feel so alone in my summer-hating-ness! Although this year…..drawing the flowers and painting them from the garden outside has really made it less hateful. And the heat hasn’t been as bad this year either. Bonus. MD. At times, yeah. We’ve had 110s, or at least heat indices there. Not hardly at all this year, though. Thankfully. Free-handing is perfect! It’s not an architectural blueprint; it doesn’t have to have precise angles and lines. 🙂 It reminds me of some Northwest Native American designs. Thanks, Teresa! Are you into quilting at all? This is a pretty cool book. Lots of other inspirational designs going on – she’s very into using every scrap of fabric you have, which is right up my alley. I wanted to learn quilting but I have one too many hobbies and have conceded defeat so I’m giving my fat quarters away to friends. :} I’ll have to remember to tell my quilting friends about this book. Thank you, Jill, I really appreciate it. She’s eating more because we tried another food we never thought she would go for and crazily enough…she did! Just hoping it holds until the vet can see her next week, so we know what we’re dealing with. I feel like she’s at least improving, but might have kidney/diabetes issues. Have you ever had a cat with either? She’s 16, so it’s worrying. Yay! Looking forward to fall foliage too, Beth? And I love fall weather best. Oh, can’t wait!